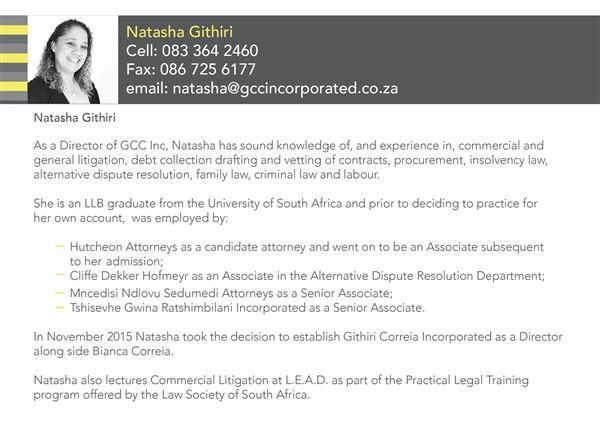 Githiri Correia Christie Incorporated ("GCC Inc") was established in June 2017 when Githiri Correia Incorporated and JL Christie Attorneys took the decision to join forces. GCC Inc provides you with professional legal services accross a number of fields. Realising that each case is different and, more importantly, that each client has different needs our core aim is to provide our clients with personalised, cost-effective legal solutions. 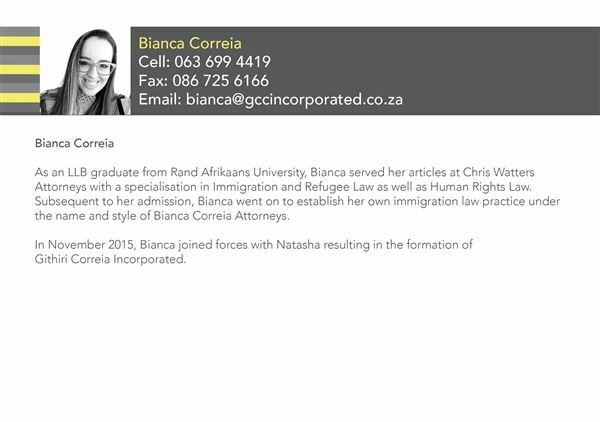 At GCC Inc we guarantee that you will receive professional, timeous and cost effective legal advice and solutions in a personalised manner. We strongly believe in doing for our clients, what we would want done for ourselves. At GCC Inc it's not just business, it's also personal.